Human thought finds a rather romantic metaphor in a rainbow. With reflection one may find more in it than a fleeting comfort. Perhaps find even a way to reconnect with our purpose and reassurance that God ordered the perfection of Angels to bow to the ‘imperfection’ of humanity. Rainbows beg the question, “If all are wronged who is right?” They set a deep contrast to the black smoke billowing from towers reduced to rubble in the west or houses turned to ash in the lands where the Abraham walked, oblivious of whether it marks the loss of material or a child. A proud Afghan standing in a queue for ‘compensation’ becomes as irrelevant to peace as those led to believe in moral wars on ideological evils, for self-righteousness comes in many guises, the absoluteness of dogma, conviction of being free from it or more still, having defeated the eternal conflict between physical temptations and spiritual quests through absolute sincerity to a constitution. One man’s righteousness can be another’s white-washed tomb and vice versa. This is why ultimately one understanding of faith and its place in society cannot be imposed universally. The rainbow is not an ascetic argument. Beauty is really in the eyes of the beholder. The Unseen is infinitely beautiful to all of us and should be the very reason to neither oppress nor be oppressed. God, may therefore, be sought individually in some societies and collectively in others but all too often we lose sight of this Rainbow. Ethnocentricity brings with it a religious ‘transference’ and a complex world of hate and greed becomes an a half-sincere call for ‘reformation’ not willing to understand that there is no central authority or hierarchy for a Muslim Martin Luther to abolish material exploitation through ‘indulgences’. For the very same reason there is no ‘ex-communication’ of terrorists – simply because there is nothing to excommunicate them from, their actions are sufficient to identify their deviousness. Yet, hypocritical cries of ‘Muslims not denouncing terrorism’ emanate from our TV screens while by and large simultaneously denying any forums to people who don’t fit in to a ‘this or that’ classification. The world gets ugly in monochrome. The diversity of a rainbow promises otherwise, where we can differ on everything including happiness being an overstocked refrigerator or a stomach half empty, a house by the lake or a modest abode, the enjoyment of losing ourselves to head banging in a concert or the content of a prayer said in solitude. Whether it is religions inspired by scripture or systems such as socialism or capitalism to manage our collective affairs, our inspiration or intent should not be questioned, nor reduced to a black and white convenience. Helen Keller for instance is remembered for what she taught us rather than her sympathy for communism. We deny this goodness to ourselves when we assume reasons for our choices are universal truths that apply most to those who disagree. It for this reason that we point to the inheritance of women but fail to take in to account that the same faith granted inheritance rights to women 1200 years before England and that the very same faith allows the women to keep the inheritance for their own business or pleasure without needing to pledge any part of it to the household. Jizya becomes an evidence of discrimination when we do not acknowledge it as part of a collective social security system and in lieu of the 2.5% of savings Muslims would give to charity, including equal protection under the state. The hate-mongers of our age are like mercenaries that ambush the values of others but hide behind the general good of the religion they claim to represent, at times mere convenience and at times a very deliberately measured act. The worlds turns black and white as explanations and accusations are exchanged and anger rises, just the way a few among us wish it to be. For instance, when one mentions the massacre in Jerusalem of 1099, the role of the church in the Holocaust, that about 3% of Muslim men are polygamous and that the average sexual partners in the US alone for men is 7, that the ottoman empire under the millet system allowed personal laws to govern affairs of minorities, this seems to split the world further in to an “us” and “them.” We instantly become parties in a conflict that had seemed distant. The clash of civilizations narrative continues at a time when faiths have no distinct borders. To justify wrong’s of our age on the basis of history is to not know our own past. Humans have hard enough time agreeing on the present let alone over 1400 years of history which has seen war, peace and even luminous coexistence such as La Convivencia . What is just and right is not divine violence, nor a nations interests over others but a signature of monotheism that guides us to treating others justly, perhaps related to the concept of Carl Jung’s collective unconscious that has been expounded by some to represent a collective ‘known’ truth. “When thy Lord drew forth from the Children of Adam – from their loins – their descendants, and made them testify concerning themselves, (saying): “Am I not your Lord (who cherishes and sustains you)?”- They said: “Yea! We do testify!” (This), lest ye should say on the Day of Judgment: “Of this we were never mindful” Quran Surah Al-Araf (The Heights) Ayat 172. In seeking moral superiority or denying others the right to differ, we return to a pitch dark. We become exceptional for some tough questions follow if we have to follow what the scriptures teach us. The rainbows become a rarity in the polluted skies of our times, not just because of obscure hate filled videos from fringe elements hiding in mountains and killing more of their coreligionists than the “evil” they claim to be battling, but a very systemized narrative of convenience unleashing overt wars or covert subversion in the name of an equal conviction of being the keepers of “the way.” The irrationality of being absolutely right and absolutely wrong has played out all too long. Yet, the gray clouds, the thunder and lightning at times, are the very harbingers we hope for. It is in our children’s eyes that the secrecy of tomorrow will reveal itself. 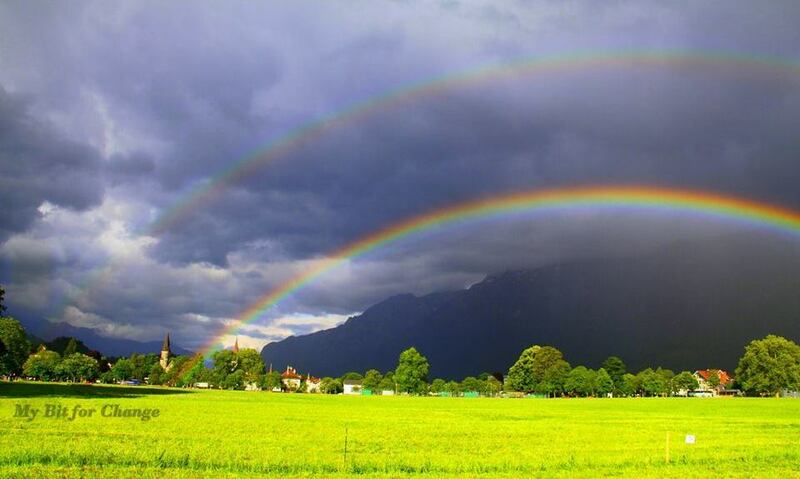 We owe them rainbows – for they are a rather romantic metaphor. Makes so much sense. I like it. I really think the time has come 4 us 2 let the scales of segregation, intolerance of any kind and violence fall off our eyes and let d love of God pervade our hearts and environment. But alas! That scheming enemy of man and world peace – the DEVIL – that architect of hate, lies, fear, destruction and all the evil the world has experienced won’t want this to be. Yet God has given us the POWER and WILL to OVERCOME him and all his cohorts; all we need to DO is to RECOGNISE the STRENGHT we have in God and put it to USE. Terrorists have no religion. They have nothing to do with Islam, Christianity, or any other religion. This is the game of benefits being played by the opportunists all over the world (including states). In my humble opinion humanity is one and clergy of the different religions misguided the humanity at large for their own worldly benefits. All the messengers / prophets / apostles of God came only to unite humanity and to teach humanity to do righteous deeds. This is clearly mentioned in Quran as well in verse 62 of chapter 2 (Surah Al-Baqarh) here is translation of this verse: “Those who believe (in the Qur’án) and those who follow the Jewish (Scriptures), and the Christians and the Sabians, any who believe in Allah and the last day, and work righteousness, shall have their reward with their Lord; on them shall be no fear, nor shall they grieve”. Nothing else is the message of God delivered by the messengers of God. So humanity is one. Only righteous deeds are required at collective level. Now rest of the picture of affairs is before you and you are much learned to appreciate and understand the contest of Good & Evil. In Humanity, if one wants to divide it in religions, then in my humble opinion there are only two basic religions, Religion of “Good” and Religion of “evil”. So at the moment, Pakistan is haunted by the “evil” shadow. And we need all “Good” members to do efforts and prayers for peace in our homeland and world at large.